1X - $69.99 3X - $69.99 Only 3 left! Do you feel the need… for speed? Do you love feeling the wind in your hair? Have you always dreamed of flying? 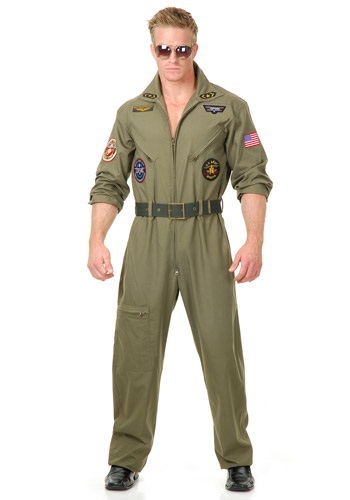 Or maybe you’re just a really, really huge fan of Top Gun and want to emulate your hero, Maverick. Obviously, the best way to do that is to join the U.S. Air Force and become a fighter pilot. Then you’ll have a chance to fly the Grumman F-14 Tomcat just like Maverick, exceeding speeds of 1,500 miles per hour. Just imagine how sweet that would be! Of course, in order to earn your wings and jump behind the controls, you’re going to have to put a lot of work in first. You have to earn your bachelor’s degree. You have to pass the rigorous Air Force Officer Qualifying Test. You have to survive eight grueling weeks of Officer Training School. Then there’s Initial Flight Training and Undergraduate Pilot Training. All this takes years to complete, and there’s no guarantee you’ll get to pilot that highly desired Tomcat. If that sounds like way too much work, we’ve got a second option that’s nearly as good: the Plus Size Pilot Costume. Yes, technically, you won’t be a pilot, so you won’t get to fly through the skies with the wind under your wings. But you’ll look like a pilot, and that is pretty much just as good, right? The olive green jumpsuit looks like it could be at home behind the controls of any military jet. It features zipper-closed cargo pockets, a nylon webbing belt with a gold-tone metal buckle, and assorted decorative patches to really seal the deal. You’ll be the most fashionable flyboy around! I ordered this costume and was immediately pleased with my results. First I boosted my confidence by playing Ace Combat with the suit on. I felt like a true drone pilot. I pretty much earned a Bronze Star for my heroics. Then, I tried my swag at a bar in Charleston, SC named the Pantheon. I was flocked by potentials all night. Unfortunately, the person I brought home turned out to be a bit different than I originally intended; but, I asked myself, "What would an Air Force pilot do?" Of course I finished the job. The next day I scored numbers with three separate women. They turned out to be psychologists and just wanted to "help". I think we all know what that's code for. I don't have time to recount all my epic tales here, but this suit helped me be just like all the Air Force guys you see running around having a blast! Note: This costume does not come with a chair, nor instructions on how to complain about normal life events. I also noticed it smells a bit after a couple weeks if you don't wash it.